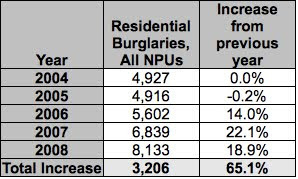 The Good News: Residential burglaries are down 2 percent in Atlanta so far this year. The Bad News: That small dip follows a 65 percent spike during the three previous years. So reports Terminal Station, an Atlanta real estate blog that has started picking apart Atlanta’s crime statistics. An excellent, if somber, analysis that advances discussion of the issue beyond the spin from City Hall.